Review Summary: This cart is certainly one of the toughest and most durable garden utility carts available. It’s made from a high-strength poly, has a steel frame for reinforcement, and comes in a black finish. Because of the poly bed, very little maintenance is required. All it requires is a simple wipe or rinse and it’s cleaned with ease. Standing at 45.2 x 25.6 x 25.2 inches, weighing in at only 58.6 pounds this tough little cart is a beast. Built with a bed made of high-strength poly, it can haul an impressive 1,200 lbs of festival camping supplies with ease. That's more weight than many of it's competitors can haul. That's not too bad for a cart that only weighs about 60 lbs. It features a steel frame and a classic black finish to support the bed and your gear. 13 inch pneumatic turf rubber tires can handle almost any of the roughest terrains. 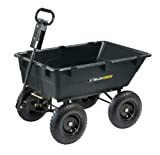 5/8-inch diameter axle allows this utility cart to turn around sharp turns and radiuses with ease. The straight padded patented “D” shaped pull handle can be hooked up to an ATV, a riding lawn mower, or pulled by hand easily. It has a very neat quick-release dump feature that is sure to save time, your back, and make it easy to unload any sized load you can haul in it. That’s so much more to this cart than its components. The sturdy construction makes it a workhorse of a designed for tough work, whether that's around the house or camping and festival going. A considerable 1-year limited warranty from Gorilla Carts protects you in case something happens to the garden cart. As far as assembly goes you will need a 13mm wrench, a 13mm closed end wrench and a small work space. A second pair of hands would be “handy”. The instructions are simple but can be difficult to understand at times. Therefore take your time and follow the instructions carefully. Some consumers have reported that some nuts and bolts were not threaded properly and thus needed to be replaced by some obtained from a local hardware store. This may or may not be a concern or possible issue to consider, it did not seem to be a wide-spread problem and the screws and bolts in question are usually only a few cents to purchase. Another point to be made is that like all things bought and sold some will wear down with time and or use; rubber pneumatic tires are no exception to this. If they happen to meet a terrain or use they can’t handle they might need to be replaced. There are brand name and generic replacement tires that can be bought for very little. Removing the damaged tire and installing the replacement tire requires little skill and goes on with as much ease as they were removed. I’m very happy with the cart, it’s well made, sturdy and durable." While dumping, the back wheels move in towards the front wheels, allowing for a very easy dump even with a heavy load." The Gorilla Cart GOR866D Heavy-Duty Garden Cart is a nice, well-constructed garden cart that has several features that make it a garden cart that stands above the competition. The sturdy design, steel chassis, and heavy-duty poly bed make it one of the toughest utility carts around. Beyond the physical construction of the cart, the 2-in-1 convertible handle, and quick-release dumping give it a versatility that is unbeaten. This garden cart can handle most jobs other utility carts can’t handle. And it handles them with ease. Not too bad, given it's only 58.6-pound design and 1,200-pound capacity. This utility cart is certainly one to check out, or at the very least put a star by for later reference. We give it a 4.5/5 stars. You can find all the replacement parts for the GOR866D via the Tricam Industries site. You've read our opinion and what we think about this well designed heavy-duty utility cart from Gorilla Carts. Interested in having the Gorilla Carts GOR866D Heavy-Duty Utility Cart for yourself? Have you purchased one of these GOR866D Garden Carts from Gorilla Carts? What do you think about it? Does it suit your needs? Or does it have some issues that you really hate.